After you can define something, you can then begin to fulfill it. If you cannot define what a friend is, surely you cannot be a friend. I have learned through the years that everyone’s definition is not the same. We have so many different perspectives of what a friend should be. In order to be in agreement, the people who are in the relationship must define what their friendship truly consists of. One of the worst things you can do is go into any relationship without discussing what you expect up front to avoid surprises and disappointments later. Some people have never been taught how to be a friend and then there are those who believe they are good friends and in all actuality, they are not. So, sit down and ask yourself what does my perspective of a good sista-friend looks like. It is crucial that you both agree up front to avoid false expectations. 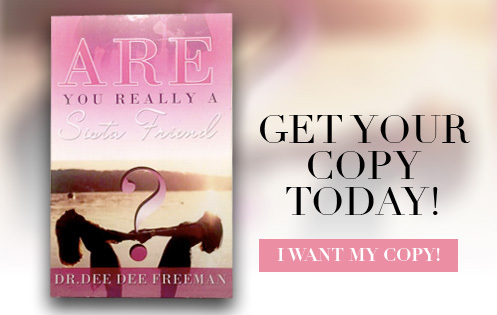 In my book, “Are You Really My Sista-Friend”, we dispel some of the evils that are keeping you from being the best friend that you can be. There are many perspectives of what a friend is and this is a major problem in developing healthy relationships. Here, I challenge you to defines what a sista-friend is, and share my own definition and experiences so you can be on the same page when starting a new friendship. Grab a copy for yourself and your friends and let’s pursue better friendships! Thank you… Thank you for this weeks blog!!! This is a area in which , I have struggled for years with. Everyone who has tried to become close to me and I have found ways to push them away. Hello Pastor Dee Dee, I define friendship as knowing that someone is there and loves unconditionally. A person that knows their place in your life. A person that you don’t really have to talk to on a daily. If you do fine, if not then the friendship is still ok. I think women have to be really mature and have confidence along with loving themselves in order to share in a Real friendship. And if you are there then you will walk in what the word says you must show yourself friendly to gain friendships. I have two friends one I have had for years we don’t talk daily, but we can always pick up from our last conversation. God has sent another friend and prayer partner and we are developing our friendship again not someone I talk with on a daily, but know she’s there for me. And I have a friend that’s older and we work together and we take care of each other. I really love all three of them to life! THIS IS AWESOME,I’M GOING THRU THIS NOW,THANK YOU SO MUCH SUS,GOD ALWAYS SEND SHOW UP JUST WHEN I NEED HIM THE MOST,THANKS SO MUCH.LOVE YOU SIS. I luv u young ladies and admire your relationships. We all need people like this in our lives that add to not take away from us. True friends to the end even when we don’t agree, or tell each other things things that help you or check you on something you or I need to work on. I like the point about seasonal friends. We definitely need to know the difference. I thank God that I have one friend whose kids call me Auntie and I have know for forty years. The other friends that come in my life have a different place . When they phrase out of my life, I don’t have to feel bad because they were seasonal. Thank you guys I loved all the opinions! Well, well ,well , Friendships , female friends I really struggle in this area !! Why , I think because I been hurt and disappointed so many times . So, I just don’t let people in 😢 I’m very much a loner . The Friends I have are long term , but very distant. I’m praying that I will get better with this. I realize that instead of having the hard conversations. It seems like when I try to have the hard conversations what I say seems to be said or heard wrong and it ends up someone being hurt either me or them . So, I just back off ! Stay to myself . So, Monica I understand !! Now sharing this is going to do what ?? Dr. Dee Dee, you are always a positive inspiration no matter how it’s portrayed, know that it’s received! Thanks a grand million!!! Love you that was delicious to the mind and heart. Thank you ladies. Good conversation and good stuff. 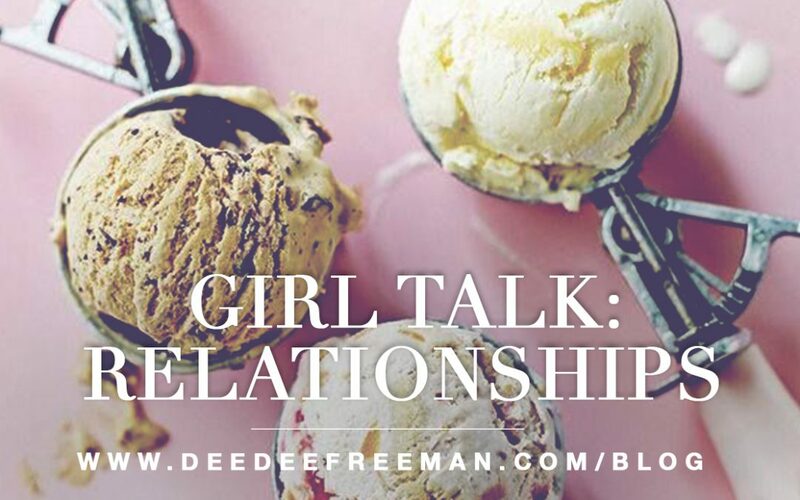 That’s a question I am going to put to my girls at my next Girl Talk: Relax and Chill. Great topic!I could barely hear but the little I did hear I can relate to. That was excellent. I thought I knew the answer to this but I definitely have some more defining to do. Thank you for pushing me in all of these areas. ❤️❤️❤️U! That was so…..awesome! A lot of women don’t have that especially in church & it is vital to have that connection with another sista. I prayed & God sent me great friends I’m grateful for my connections! I believe that friendships are special and when you share the commonality of the Holy Spirit then it should be real, forthright and with love. I agree that there are seasons of friendships and as women we shouldn’t have to compete with one another for it. We should understand we can’t be everything to everyone. I really really enjoyed this blog. I love the videos, it’s like icing on a cake. As I get older I have truly began to learn that friendships come in all kinds of packages. Over the course of my marriage I’ve been experiencing seasonal friendships and I am totally fine with that. It was heartbreaking when certain friendships fizzled out but I understood the nature of what was going on. I’m still praying for God to continue to send me awesome friends that will sharpen me and I them. Thanks so much for this blog! I really, really enjoyed it. Thank you to all the ladies for your definition of friendship. I struggle in this are due to being hurt but as the woman of wisdom stated friendships have seasons. I didn’t get to hear the live discussion but I love his topic! I think it’s imperative to love your neighbor (friend) as you love yourself. Loving yourself has to come first before you can really be a good sista-friend. This helps to avoid unrealistic expectations because you will be more focused on what you can add to your friend because you already love yourself. Many women say they get hurt by other women and of course this happens but maybe the more we love ourselves and know ourselves, we can love and really get to know others and the expectations are more realistic and not so burdensome. Let’s give each other a break as women… this will help give that sista friend some room to breathe, grow and become; something we all as women are in process. Nobody’s perfect – be the friend you want! My best sista friend for 20 years is not perfect and neither am I but we are proven and love being friends. All great, great points. I’ve been really thinking on this very subject. Had some relationship changes recently… some go and some come. Working on definition and expectations. This will be a help n guide. Thanks!!! Hi! Dr.DeeDee, I been checking my emails periodically during the day in expectation and excited about receiving today’s blog. So yay!!! Ok friendships to me are like good gifts. Every package/friendship is different and should be. All of the ladies did an awesome job defining friendships. I concur to all of the definitions. This blog was so inspirational. Thank you Dr.Dee Dee and all the women in the video. I have struggled with friendships all my life. I am still working on it. The comments from the other ladies were good too. Wow, that’s exactly what I needed. I had a conflict with a friend who had all these expectations that I was not able to fulfill because we were on different pages and understanding of our relationship that escalated into something ugly but thank God we were able to resolve it. This helped me evaluation where this particular friendship / relationship stands. I wanted to cut all ties but God said leave it alone. . Thank you for your weekly blogs, they are a huge blessing in my life! 😢 You girls are absolutely AWESOME! Thanks Dr Dee Dee for always healing girls where they hurt! I received a huge breakthrough with the season friend; due to I’ve had to release a friendship and was little bothered with the peace that I have with letting her go considering we’d been friends forever; for sure our season has come praise God there’s NO ill feelings. Infact I’ll always love her, holding fast to all of the good times we shared! It’s just that our season has come to part ways…It is well! Great topic ladies! I love you all dearly. Speaking of love yeah I can share a tear too Darniece because when I love, I love hard in any relationship. The word friend is a very powerful word to me because there is a lot of trust and love involved. Through my journey of friendships I have notice that the love I put out is not reciprocated, not that I need it to be because I still love despite of. But at the same time I need to know what is the true meaning or definition behind our friendship. My point is I love to love but at the same time I need to know if it is genuine because I can really come at you if I feel you have been taking up a space in my life that is very precious and you had some other motive. Thank you for your insight. I am the National Chaplain for Sigma Phi Psi Sorority Inc. for United States Armed Forces Women. Friendship is one of our Big 8 Platforms. I have been stuck on pause because I have wanted to address the issue of Sisterhood from the Bible and the sister social perspective. Thank you for your perspective on the subject and I will let them know it came from my sister-mom-sista in the “Faith”. As always, I love you, and again I thank you. I love this blog. I have always said that my friends are precious jewels, of different kinds. Although one particular friend who is so precious to me. Always try to size up my other friends. In doing so it almost destroyed our friendship. I just wanted her to know that even though she is my friend, I still love and enjoy being around my sandboxes when I can see them and without the drama. I know my role and I play it well yet I’m still open for her and I being the best covenant sisters that I’ve ever had. Great wisdom from great women. Thank for sharing. This week was awesome. This make you self evaluate your friendships. Good groceries as usual. Thanks Mom! This was so good. Real talk. That is what women really need to establish more in our relationships; real talk. Helping each other define what our needs are in each friendship. Then like you said, nobody will get hard feelings toward the other. We need sister-friends, especially in the body of Christ because we share a common bound, Jesus. His Spirit will help us define the real for each relationship. Thank you again Dr. Dee Dee. Be Blessed. This was really good, thanks for having and sharing the topic! It is so needed because women are forever tripping when it comes down to more than 2 in a circle! Great in sight from all. This is good stuff to understand about relationships. I loved the vlog and hearing from all the sisters. Thank you!